Be the first to hear about their new releases and deals. 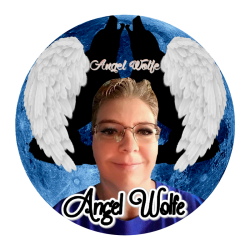 Download the Booksprout app and search for Angel Wolfe today! Angel was born in Muscatine, Iowa and learned to read by the age of three. When she was five, she moved with her family to northwest New Mexico. At the age of eleven, she began reading romance novels pilfered from her mother. In high school, she often sat with the textbook open and a romance novel sitting inside it and after high school, she began writing stories in notebooks because she didn’t own a typewriter. Later, Angel neared completion of her first novel, Damaged Hearts but she couldn’t bring herself to end it until recently. Since that time, she has written four short stories and has published a holiday novella and a contemporary novel and currently is nearing completion on a paranormal romance novel. When she's not writing or curled up with a book, she loves to watch her favorite drivers racing around a dirt oval at one of many tracks across the United States. One of her greatest dreams is to find herself published and listed on the New York Times bestsellers list.